Renergen Limited, incorporated in the Republic of South Africa, and Anheuser-Busch InBev SA/NV, have concluded a Liquefied Natural Gas (LNG) Fuel Sales Agreement through their respective subsidiaries Tetra4 Proprietary Limited and South African Breweries (SAB). The agreement calls for the provision of natural gas by Tetra4 to SAB to use in displacing diesel use in trucks. 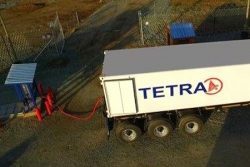 The Agreement sees the initial roll out of compressed natural gas (CNG) to a small fleet of trucks in the Gauteng area, using gas from Tetra4’s Virginia operations. This will be upgraded to a significantly larger fleet to run on LNG once Tetra4’s plant reaches operational status in 2019. “This agreement with SAB marks another large scale South African logistics operation to use new age fuels. The use of LNG not only drastically reduces carbon emissions, but has the added advantage of improving the vehicle’s lifecycle maintenance and reduces the operator’s cost significantly. Renergen wants to remain a pioneer in alternative energy sources, and is proud to be associated with SAB in such a landmark agreement,” said Renergen CEO Stefano Marani. Tetra4, a natural gas producer that provides sustainable, clean energy solutions to large-scale users in the Free State mining region, also supplies Compressed Natural Gas (CNG) to CNG converted buses operated by Megabus in the Free State.